It never ceases to amaze me, the resiliency of dogs. Here in Minnesota, we have been having some of the coldest temperatures of the decade. Minus 10 and 20 below zero, for weeks on end! On top of that, we have about 3 feet of snow on the ground! It has been challenging to walk dogs, to say the least. My customers all live within the same area, Lakeville, Prior Lake, Eagan and Savage. Suffice it to say, that I feel very lucky that I can wear layered clothing. But, all the dogs I walk, have nothing more than a stylish fur coat on. Yes, they all seem to enjoy being outside, no matter what the weather. We have a lot to learn from our good friend, the dog: Enjoy life no matter what the weather and just roll with the snow. 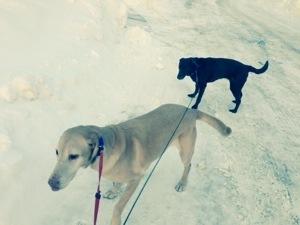 Frannie and Ellie, The Labrador Girls from Lakeville, MN, enjoy their winter walk before dinner. 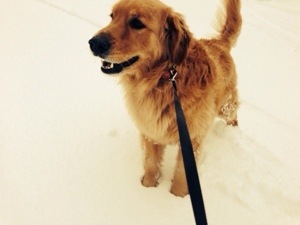 Lovable Simon, Golden Retriever from Lakeville, MN, is impervious to the cold – he so enjoys taking long walks, no matter how cold it is. 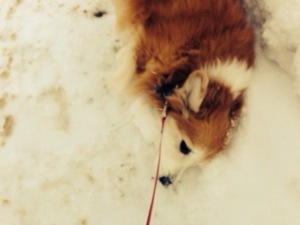 Sweet Daphne, funny, cute Corgi from Prior Lake, MN, loves rolling around in the newly fallen snow.